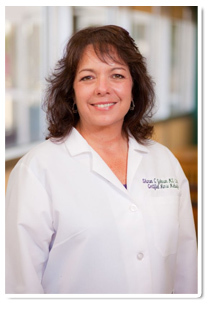 Began career in women's health nursing in 1989, and has practiced as a Certified Nurse Midwife for past 13 years. Received nursing degree from St. Petersburg College in Florida, and master's degree and midwifery training from Philadelphia University in 2000. Loves being a mother, midwife and friend. Enjoys life and approaches it with positive outlook, finding good in any situation. Focuses on the woman, her family and their needs whether before, during or after pregnancy and birth. Believes each woman has the right to be involved in her care and guide her own experiences. Considers herself a “facilitator” to ensure the health and safety of women and their families. Especially enjoys the waterbirth experience and caring for teens. Has privileges at St. John Medical Center and also Fairview Hospital.